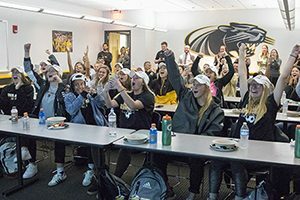 UWM’s women’s soccer team opens NCAA Tournament play 3 p.m. CST Saturday at Santa Clara University. UWM is 16-1-1, and the trip to California marks its first NCAA Tournament appearance since 2013. Santa Clara, 16-3-1, is seeded third in its quadrant of the 64-team bracket and ranked seventh in the latest United Soccer Coaches poll. Should UWM advance, it will face the winner of a game between Northwestern and North Carolina State. Milwaukee is led by Horizon League Freshman of the Year Haley Johnson, as well as fellow all-league first-teamer Kelli Swenson, the Horizon League’s Defensive Player of the Year for the second consecutive season. The Panthers appear in the “others receiving votes” portion of the United Soccer Coaches poll, and would rank 38th if the poll extended that far. This will be UWM’s 12th appearance in the NCAA Tournament and 11th with the Horizon League’s automatic berth. Santa Clara sports its highest win total since going 17-2 in 2001, when it won the national championship. The Broncos, runners-up in the West Coast Conference, earned an at-large berth to their 28th NCAA Tournament.